Cook pasta noodles until al dente; drain and cool. 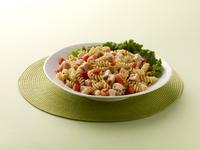 Combine pasta, onion, olives, peppers, tomato, celery, broccoli, and cabbage in large bowl. Add turkey; toss to mix. Blend garlic with dressing and pour mixture over turkey and vegetables. Toss to coat. Line salad bowls with leaf lettuce, and fill bowls with salad greens. Place turkey vegetable mixture on top, tossing slightly to mix dressing with greens.